Web content refers to the aural, visual and textual contents encountered by online users when visiting websites. Among the major components of these contents are texts, sounds, videos, animations and images. It may also include e-services, applications, documents, data, archived email messages and personal web pages. If you want to become effective in web writing, then it is advisable for you to completely understand all the vital elements of web contents. It should also be noted that web content essentially comes in two types. The first one is the text while the other type is the multimedia. Web contents as texts (textual web contents) refer to those texts that are specifically written for websites not those that are copied and pasted from printed sources. These are written contents within a web page whether they are written inside images or in the form of text blocks. Textual web contents may also include reliable internal links as a means of helping readers gather more information about the topic while also helping them scan the whole text. These target a global audience. Web contents as multimedia are any other contents that are not categorized as texts. These usually include animation, sounds, videos and images. Web contents are usually found in blogs, online discussion boards, search engine websites and e-commerce websites. The most common themes used by web content writers for their write-ups include consumer commentary, personal introspection, product reviews, e-commerce sites and topic related articles. If you want to become a successful web content writer and earn a substantial amount of income along the process, then the web content certification program which is now available at Brainmeasures is highly recommended for you. The web content course offered by Brainmeasures makes it a point to hone your writing skills and make all these suitable when it comes to writing for the web. With the help of this certification course, you allow yourself to undergo a highly reliable web content training which explains in detail all the factors that you need to consider when writing for various website owners, blog sites and online forums. The web content certification course can also help you improve your writing skills so you can continue to produce articles and any other forms of write-ups in an engaging, factual and informative manner. 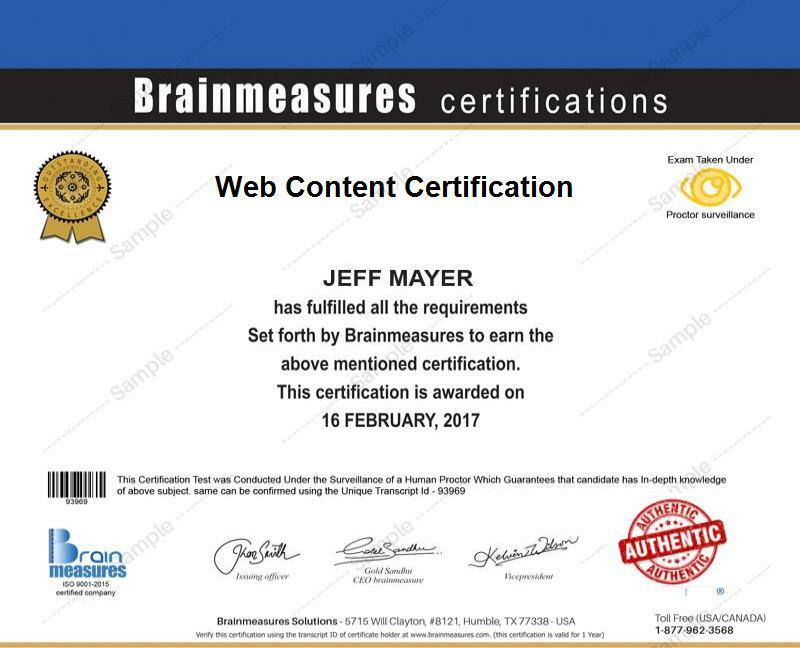 Completing your web content certification course in Brainmeasures is a major help in receiving your certificate in this field. You will then become a certified web content writer whose expertise and skills are sought by various website owners and any other online users. Anyone who wants to hone their skills when it comes to writing for websites can take part in the web content certification course offered by Brainmeasures. It is most suitable for those who are greatly interested about becoming a certified web content writer, those who want to enjoy a flourishing career in the field of e-learning, technical writing and online publishing and medical writing and for any aspiring web content writer who wishes to hone quality and lasting writing skills while also improving their ability to perform quality research and prevent plagiarism. Completing a web content certification course also allows you to reap great financial rewards in the end considering the huge amount of salary that you can earn from working in this industry. If you work as a web content writer after you successfully complete your web content certification course, then be aware that you can charge your clients on a per hour, per word or per page basis. The standard rate which you can ask your clients on a per hour basis is within the range of $10 to $50 per hour. If you want to get paid based on the number of words you have written, then you can charge your clients $0.02 to $1 per word. If you decide to get paid on a per page basis, then the average pay that you can charge your clients is around $75 per page.